The time frame on which a trader opts to trade can have a significant impact on trading strategy and profitability. Day traders open and close multiple positions within a single day, while swing traders take trades that last multiple days, weeks or even months. These two different trading styles can suit various traders depending on the amount of capital available, time availability, psychology and the market being traded. One trading style isn't better than another and it really comes down to which style suits a trader's personal circumstances. Some traders opt to do one or the other, while others may be day traders, swing traders, and buy-and-hold investors all at once. Day trading attracts traders looking for rapid compounding of returns. Assume a trader risks 0.5 percent of her capital on each trade. If she loses, she'll lose 0.5 percent, but if she wins she'll make 1 percent (2:1 reward-to-risk ratio). Also, assume she wins 50 percent of her trades. If she makes six trades per day, on average, she will be adding about 1.5 percent to her account balance each day, less trading fees. Making even 1 percent a day would grow a trading account by more than 200 percent over the course of the year, uncompounded. On the flip side, while the numbers seem easy to replicate for huge returns, nothing's ever that easy. Making twice as much on winners as you lost on losers, while also winning 50 percent of all the trades you take, doesn't come easily. You can make quick gains, but you can also rapidly deplete your trading account through day trading. Swing trading accumulates gains and losses more slowly than day trading, but you can still have certain swing trades that quickly result in big gains or losses. Assume a swing trader uses the same risk management rule and risks 0.5 percent of his capital on each trade with a goal of trying to make 1 percent to 2 percent on his winning trades. Assume he earns 1.5 percent on average for winning trades, losing 0.5 percent on losing trades. He makes six trades per month and wins 50 percent of those trades. In a typical month, the swing trader could make 3 percent on his account balance, less fees. Over the course of the year, that comes out to about 36 percent, which sounds good but offers less potential than a day trader's possible earnings. These example scenarios serve to illustrate the distinction between the two trading styles. Altering the percentage of trades won, the average win compared to average loss, or the number of trades, will drastically affect a strategy's earning potential. As a general rule, day trading has more profit potential, at least on smaller accounts. As the size of the account grows it becomes harder and harder to effectively utilize all the capital on very short-term day trades. Day traders may find their percentage returns decline the more capital they have. Their dollar returns may still go up, since making 5 percent on $1 million equates to much more than 20 percent on $100,000. Swing traders have less chance of this happening. Capital requirements vary according to the market being trading. Day trading and swing traders can start with differing amounts of capital depending on whether they trade the stock, forex or futures market. Day trading stocks in the US requires an account balance of at least $25,000. No legal minimum exists to swing trade stocks, although a swing trader will likely want to have at least $10,000 in their account, and preferably $20,000 if looking to draw an income from trading. To day trade the forex market, no legal minimum exists, but it is recommended that traders start with at least $500, but preferably $1,000 or more. To swing trade forex, the minimum recommended is about $1,500, but preferably more. This amount of capital will allow you to enter at least a few trades at one time. To day trade futures, start with at least $5,000 to $7,500, and more capital would be even better. These amounts depend on the futures contract being traded. Day trading some contracts could require much more capital, while a few contracts, such as micro contracts, may require less. To swing trade a variety of futures contracts, you need at least $10,000, and likely $20,000 or more. The amount needed depends on the margin requirements of the specific contract being traded. Both day trading and swing trading require time, but day trading typically takes up much more time. Day traders usually trade for at least two hours per day. 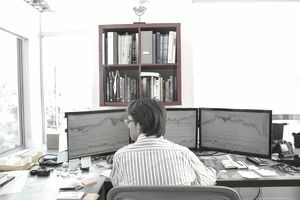 Adding on preparation time and chart/trading review means spending at least three to four hours at the computer, at a minimum. If a day trader opts to trade for more than a couple hours a day, the time investment goes up considerably and it becomes a full-time job. Swing trading, on the other hand, can take much less time. For example, if you're swing trading off a daily chart, you could find new trades and update orders on current positions in about 45 minutes a night. These activities may not even be required on a nightly basis. Some swing traders, taking trades that last weeks or months, may only need to look for trades and update orders once a week, bringing the time commitment down to about an hour per week instead of per night, or updating orders may not even be required on a nightly basis. You must also do day trading while a market is open and active. The most effective hours for day trading are limited to certain periods of the day. If you can't day trade during those hours, then choose swing trading as a better option. Swing traders can look for trades or place orders at any time of day, even after the market has closed. Swing traders are less affected by the second-to-second changes in the price of an asset. They focus on the bigger picture, typically looking at daily charts, so placing trades after the market closes on a particular day works just fine. Day traders make money off second-by-second movements, so they need to be involved while the action is happening. Swing trading and day trading both require a good deal of work and knowledge to generate profits consistently, although the knowledge required isn't necessarily "book smarts." Successful trading results from finding a strategy that produces an edge, or a profit over a significant number of trades, and then executing that strategy over and over again. Some knowledge on the market being traded and one profitable strategy can start generating income, along with lots and lots of practice. Each day prices move differently than they did on the last, which means the trader needs to be able to implement his strategy under various conditions and adapt as conditions change. This presents a difficult challenge, and consistent results only come from practicing a strategy under loads of different market scenarios. That takes time and should involve making hundreds of trades in a demo account before risking real capital. Choosing day trading or swing trading also comes down to personality. Day trading typically involves more stress, requires sustained focus for extended periods of time and takes incredible discipline. People that like action, have fast reflexes, and/or like video games and poker tend to gravitate toward day trading. Swing trading happens at a slower pace, with much longer lapses between actions like entering or exiting trades. It can still be high stress, and also requires immense discipline and patience. It doesn't require as much sustained focus, so if you have difficulty staying focused, swing trading may be the better option. Fast reflexes don't matter in swing trading as trades can be taken after the market closes and prices have stopped moving. Day trading and swing trading both offer freedom in the sense that a trader is his own boss. Traders typically work on their own and responsible for funding their accounts and for all losses and profits generated. One can argue that swing traders have more freedom in terms of time because swing trading takes up less time than day trading. One trading style isn't better than the other; they just suit differing needs. Day trading has more profit potential, at least in percentage terms on smaller-sized trading accounts. Swing traders have a better chance of maintaining their percentage returns even as their account grows, up to a certain point. Capital requirements vary quite a bit across the different markets and trading styles. Day trading requires more time than swing trading, while both take a great deal of practice to gain consistency. Day trading makes the best option for the action lovers. Those seeking a lower-stress and less time-intensive option can embrace swing trading.